Hackett's Pond is a little pond in Hanover, MA hidden in between a couple of neighborhoods. Access to the pond is very limited as there are only 2 places where you can get to the water from the streets. Unless you live on the pond, you must access the pond down Dillingham Way off of Main St. It can be a little strange using this road though as it is more like a driveway which leads to a home/office of a small company. Although anytime I've parked down there no one has had a problem with it, its still a little weird. There is also a path leading to the pond through the woods that you can find on Hackett's Pond Drive. Ok so now for the fishing, from the shore there are a couple of spots you can try and fish where I have had success. All of the shore fishing access is located on the southern shore which is the short side of the pond. The southeast corner is where you can drop in a small boat if you so choose. On that corner are some tall reeds and lilly pads that you can fish with some rubber worms/frogs. Along the southern shore there are more lilly pads and some overhanging bushes that often have some activity nearby. Since there are a lot of insects around this pond, there are a lot of fish feeding on surface of the water so it's easy to locate some fish. The southwest corner, where the dam is located, is much deeper and has a large tree overhanging the water. This has been the most promising spot for me when I have fished at Hackett's. 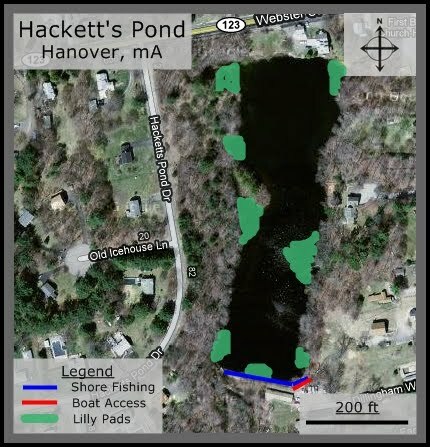 If you do get a boat in there, I would suggest working the western shore where there are two inlets and several patches of lilly pads where you are sure to catch some fish. Keep in mind, this pond is very small so don't expect to catch any monsters but expect a lot of activity. Successful Bait: Worms- Watermelon, Black w/ blue flakes. Jerkbait- Silver, Spinner Bait -Black skirt.